While most of my friends lived on pizza in college, I lived on Top Raman. I would buy five different flavors to fool myself into thinking that my diet had variety. If MSG were truly harmful, I'm pretty sure it would have shown up in me by now. 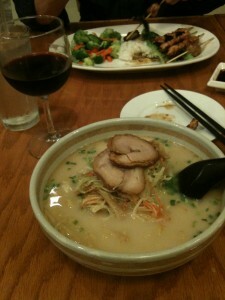 The Tonkotsu Raman at Yakitori wasn't at all like my college experience. It couldn't be - after all, it's from The List. The noodles were cooked to perfection - there was REAL protein on top of it all, and broth that was appropriately seasoned. It was a solid, yummy meal. However, I must say that when a place names itself after one of its dishes, you should order that. That was Billy's strategy, and his yakitori was incredible. We practically opened the place (hitting a movie after, don't you know!) and had great service. It appears to be a neighborhood staple. The regulars started showing up around 7:30 and mingled with the sushi chef, the wait staff and other diners just as if they were there every week. Imagine a Japanese version of Cheers. Such fun to watch - and made me wish that we had a dinner spot next to our house that we loved as well. If you go - two things to remember: they are closed on Monday (!) and you should save room for the "special" - it's written in Japanese so I have no idea what it is. But the guy next to us had it and I had order envy. This dish is one of a handful of repeats from the 2011 list and its staying power is evident. So the next time you want Japanese cuisine and DON'T want to go to Buford Highway, check out Yakitori. You'll love it!